The PGA Tour heads to Florida on Thursday for the 2018 Valspar Championship. Jordan Spieth, the 2015 champion, is the Vegas favorite at 8/1, followed closely by Rory McIlroy at 12/1. McIlroy had opened at 14/1 before moving up the odds board. Before you make any bets or enter a daily fantasy golf tournament on DraftKings or FanDuel, you'll want to hear what the team at SportsLine has to say. SportsLine's prediction model, built by DFS pro Mike McClure, was all over Phil Mickelson at the WGC-Mexico Championship last week. Despite being a 20/1 long shot, the model projected him to be a top contender. The result: Mickelson shot 69 or better all four days and won in a playoff Sunday. Anybody who used their model had plenty of great value selections to choose from. Now that the field for the 2018 Valspar Championship is locked, SportsLine simulated the event 10,000 times and the results were surprising. 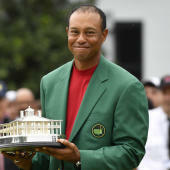 One huge surprise the model is calling for at the 2018 Valspar Championship: Tiger Woods, a 25/1 long shot, earns his first top-10 finish of the season and makes a serious run at the title. The 14-time major champion, who is playing the Valspar Championship for the first time, is coming off an impressive 12th-place finish at the Honda Classic, just his third official PGA Tour event since returning from spinal fusion surgery in 2017. Woods had 13 birdies, 49 pars, seven bogeys and three double-bogeys at the Honda Classic. At the Farmers Insurance Open, he finished in 23rd. He's a target for anyone looking for a huge payday. Another surprise: Charl Schwartzel, the 2016 champion, doesn't sniff the top 12. Don't be fooled by Schwartzel's 37th-ranked driving distance (304.3 yards) and Official World Golf Ranking of 50. He's outside the top 150 on the PGA Tour in driving accuracy (54.64 percent), greens in regulation percentage (61.67) and scoring average (72.084). He's somebody to completely steer clear of this week. Also, the model says four golfers with odds of 30/1 or longer will make a run at the 2018 Valspar Championship title. Anyone who bets on these underdogs could hit it big. So who wins the 2018 Valspar Championship? And which long shots stun the golfing world? Check out the updated odds below and visit SportsLine now to see the full projected leaderboard from the model that has been red-hot so far this season, and find out.